Here is some background. This is taken directly from the organisation’s site. 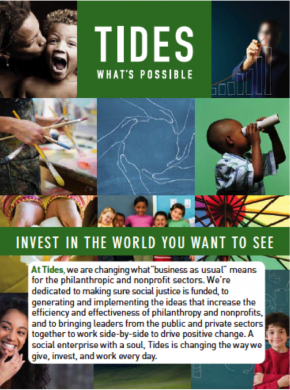 Tides actively promotes change toward a healthy society, one which is founded on principles of social justice, broadly shared economic opportunity, a robust democratic process, and sustainable environmental practices. Tides believes healthy societies rely fundamentally on respect for human rights, the vitality of communities, and a celebration of diversity. 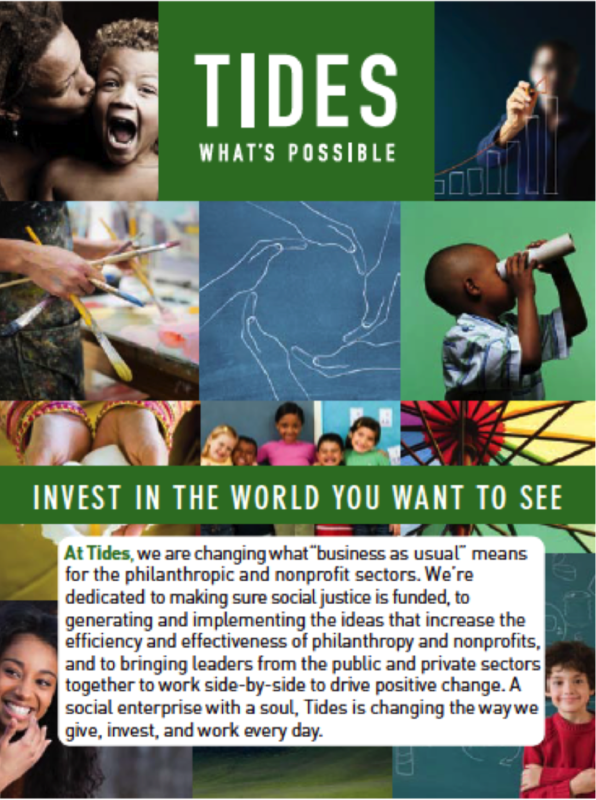 Tides is a nonprofit organization that works at the heart of today’s most critical issues, supporting grantees and programs that are core to our country’s nonprofit infrastructure and social service delivery. We work in partnership with people whose work confronts issues like global warming, AIDS treatment and prevention, and economic disparity. Bringing together people, resources, and innovation, Tides is a convener and connector for those in our community and beyond. We provide fiscal sponsorship for over 230 groups across the country, operate and support green nonprofit centers, and grant millions each year to charitable organizations across the globe. Issues we support include a veterans re-entry program, the improvement of community clinics in California, people in Africa receiving treatment for HIV, arts programs for inner city youth, adolescent nutrition, ending violence against women, civic participation to make our democracy work, and much more. In 1976, Tides was founded by Drummond Pike, one of the original social entrepreneurs; and over the years the organization has evolved from a great idea to one of the top 100 social sector organizations in the United States. Tides Foundation was started out of a need to facilitate the giving of philanthropists who were concerned with building a better future for individuals and communities all over the world. In the late ’70’s, Tides Foundation founded a Projects Program that nurtured new nonprofit activities and the program became legally incorporated as Tides Center in 1996. Through the 1980s, Tides grew slowly as we defined our role as a values based infrastructure service for progressive nonprofit work. The 1990’s was a time of exponential growth for Tides. 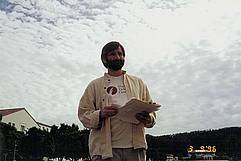 We opened the Thoreau Center for Sustainability – a twelve building complex in San Francisco’s Presidio National Park dedicated to nonprofits concerned about social and environmental sustainability; and in 1999, we founded Groundspring.org to facilitate online giving to progressive groups. In the new millennium, our real estate endeavors evolved into a program called Tides Shared Spaces which creates, operates and promotes sustainable workspace for nonprofits. To date, Tides has managed project and grantmaking activities totaling more than $2 billion. We have fiscally sponsored more than 800 nonprofit projects, and we are proud to have helped launch a number of important organizations such as Conservation International, Environmental Working Group, the Garden Conservancy, The Story of Stuff, and the League of Young Voters Education Fund. Here is a link to some of the success stories. There are a number of reasons why the word “tides” is an appropriate metaphor for our work. Tides are a clean, efficient and sustainable source of energy. Tides connect us around the world. And tides are constantly changing the landscape around us. The “Tides” name comes from a Bay Area independent bookstore that once served as a meeting place for readers, writers and activists. While honoring the progressive community which founded Tides, the name also suggests the remarkable power derived from people and ideas coming together at the right time, in the right place. Drummond Pike founded Tides in 1976 and served as President and CEO from 1976 until 2010. Drummond has played a significant role in shaping and advancing the independent sector; and the impact of his work over the years is visible in many ways. As one of the first “social entrepreneurs,” Drummond has created a legacy of innovation and increased capacity for the nonprofit sector. Drummond has been honored for his unique contributions in developing the field of philanthropy. When he founded Tides, Drummond pioneered the use of donor advised funds to support grassroots and public interest organizations on both a national and international scale. As the catalyst for starting hundreds of nonprofit projects, grantmaking funds, and organizations, Drummond’s work has positively impacted the lives of thousands of people both nationally and globally. He is an activist, a visionary, a connector, and an innovative leader who has inspired and mobilized people by helping them see the path and the structures they can use to achieve their visions. As the first leader of Tides, Drummond successfully grew the organization from a great idea to one of the top social sector organizations in the United States – that has built, mobilized, and unified people, institutions, and causes. Tides hosts many events. Below is a video showing excerpts from a Tides session on Digital Story Telling. Here is the official introduction to the video. Top executives from leading media and social change organizations came together in New York City for an evening of conversation and connections focused on storytelling for social good. Panelists include Beth Janson of Tribeca Film Institute, Michelle Byrd of Games for Change and Holly Gordon of 10×10. The discussion was moderated by Melissa Bradley, CEO of Tides. From crowd sourcing donations in a Facebook game or a film campaign to direct grants to independent media makers, funders committed to issues impacting women and girls are becoming sophisticated in their campaign strategies and ability to bring fresh, original content to an increasingly diverse audience.